Photograph courtesy Roger Geach 25031 runs light engine through Newport station on September 15th 1975. The fourteen year ten month career of D5181/25031 was spent allocated to depots on the Eastern, Western, Scottish & London Midland regions. D5179 - D5182 were ordered without boilers which no doubt affected their allocation history. Like 25026 - 25030, 25031 spent its first seven years on the Eastern Region but then moved to the Western Region for five years service in the Welsh Valleys. Shorter periods then followed for service in Scotland & the North West. January 1967 to Holbeck (55A). November 1970 to Ebbw Junction (86B). May 1976 to Springs Branch. October 17th 1977 to unserviceable store. 25031 was the 19th Class 25 withdrawn, one of two retired during December 1977. 25031 was noted at Glasgow Works by March 1978 and mostly broken up by June 1978 with the cabs lingering a little longer. Noted Darlington Works January 1966. Noted Derby Works October & November 1966. Noted Glasgow Works October 1970. Ex-works November 1973, from Derby? The frames for D5181 were laid down at Darlington Works during November/December 1962 with the locomotive placed into traffic at Gateshead on March 4th. The first seven Class 25/1s were allocated to North Eastern Region depots; D5176 - D5178 (boiler equipped) to Holbeck (55A) whilst D5179 - D5182 (non-boilered) were allocated to Gateshead. D5181 was a well travelled locomotive, spearheading the transfer of Class 25's into Devon and Cornwall to replace the NBL hydraulics, and later being transferred to the Scottish Region, including allocation to Inverness. Although these locomotives were not boiler equipped they were no strangers to passenger workings, especially during the summer months. On June 19th the 09.03 Leeds - Llandudno enjoyed the delights of D5181. The workshops at Darlington finally closed on April 2nd, although repairs had ceased in early January with 70004 as possibly the last steam locomotive worked upon. The last Type 2’s to visit Darlington Works were D5166 and D5181, both outshopped by the third week of January. 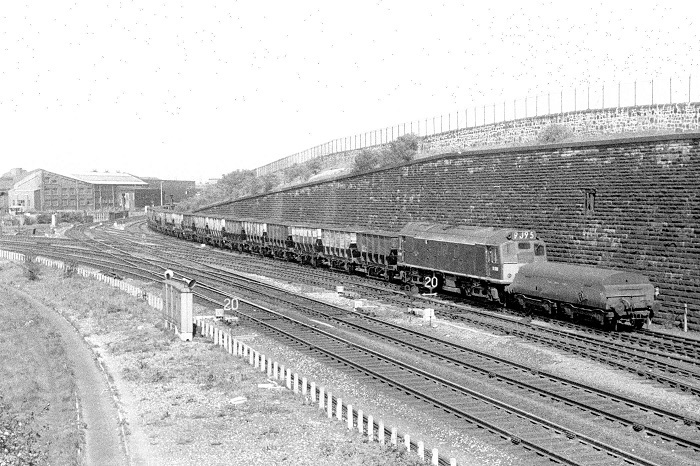 Photograph courtesy Colin Williams D5181 with brake tender and mineral train in tow passes by Gateshead on May 27th 1966. Derby Works was host to D5181 during October and November. After four years working out of Gateshead D5181 was transferred to Holbeck (55A) during January as part of the effort to clear West Yorkshire of steam traction. 5181 was noted at Glasgow Works during October. Having established a presence on the Western Region albeit initially in the Cardiff Valleys it was only a matter of time before the Class 25's penetrated further into hydraulic territory. 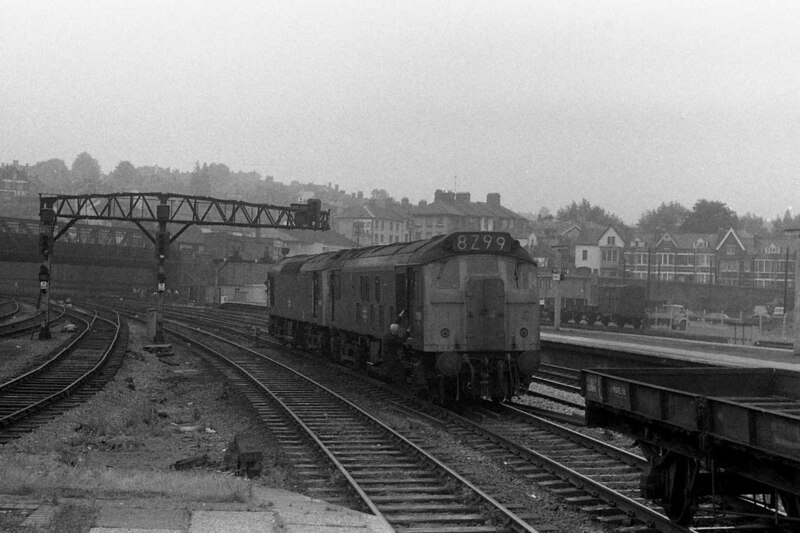 The end of July saw the Class 25s make their first appearances in the West Country, to replace the NBL Class 22s. 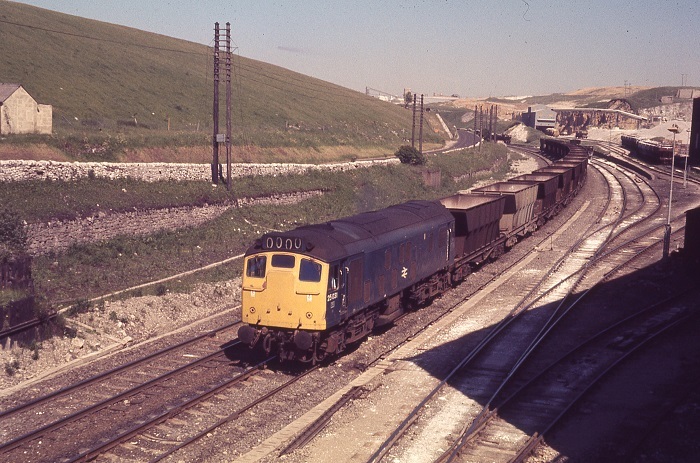 On July 30th 5180 was noted arriving at St Blazey, followed by 5179 on August 19th, bound for Laira. With these machines, and later 5181 and 7657 (September 3rd) crew training commenced. There still remained thirteen Class 22s 6308/19/22/26/30/33/34/36-39/43/56 with ten diagrams to cover. The St Blazey turns visited St Dennis Junction and the Retew branch, Tavistock Junction and Boscarne, Goonbarrow Junction, Drinnick Mill and Lostwithiel and the Truro area. Laira turns went to Keyham and Liskeard, Plymstock and lastly Devonport. The Newton Abbot locomotive visited Heathfield and Stoneycombe. Exeter turns went out to Barnstaple Junction and Torrington, Tiverton Junction, Hemyock and Chard Junction. The last turn ran out to Okehampton. A number of these turns were not daily. 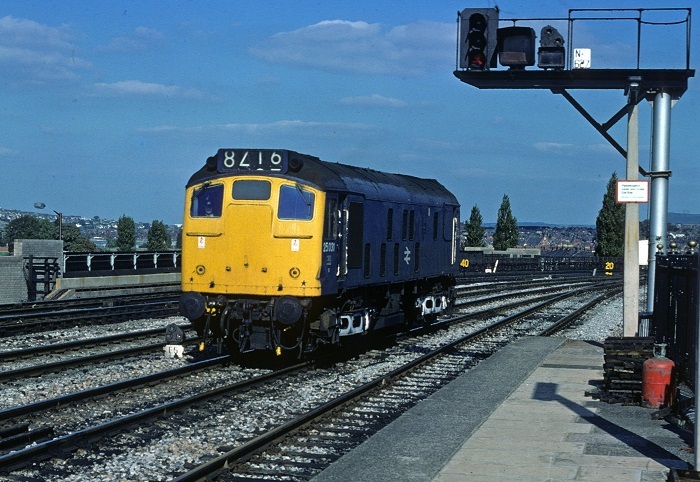 Photograph courtesy Peter Lovell A pair of Class 25s, with 5181 nearest the camera, back down onto its train at Newport sometime during 1972. Looks like a very gloomy day! During November Exeter was host to foreign Class 25s (& 31s) arriving with sugar beet from the Eastern Region, 25031 was noted on 2nd, later that day 25031 worked the 20.15 Exeter St. Davids - Newton Abbot and was noted on Exeter depot on November 3rd in ex-works condition. With the end of the summer timetable and the Western Region's dislike of the Class 25s, 25031 and several others were transferred to Haymarket during October. The following month 25031 was transferred to Inverness. On January 28th 25031 worked a Millerhill - Tyne freight, then returning north with a Tyne - Millerhill freight. Photograph courtesy Tony Sayer. 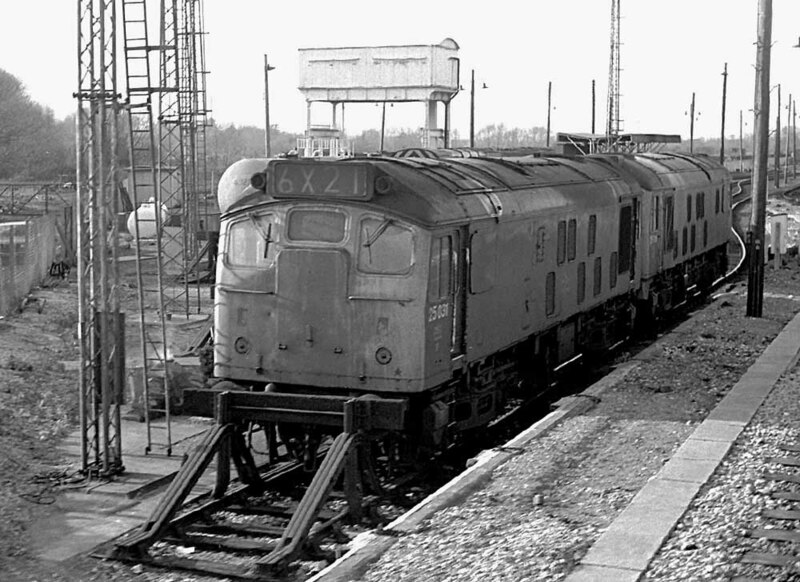 Oxford stabling point plays host to 25031 and un-identified sister on April 6th 1976. Scottish Type 2s were frequent visitors to this line on workings from Leith destined for points south. The locomotives would return north to Saltley to take up northbound workings. A new contract to move pipes from Leith Docks to several long distance locations including Derby, Wisbech and Salisbury, and shorter hauls to Carlisle, Darlington, Law Junction, Maud & Montrose would provide much work for pairs of Haymarket Class 25s. The Leith – Salisbury diagram involved the Scottish Type 2s working as far as Didcot, examples noted were 25011 & 25026 (March 13th) and 25002 & 25317 (March 27th), 25018 & 25031 (April 10th), 25026 & 25092 (April 24th), the locomotives generally returning north light, at least as far as the Birmingham area. After six months at Inverness 25031 moved to Eastfield during May. During May 25031 was transferred to Eastfield, a month later it was transferred to Springs Branch. On July 23rd 1976 a Manchester Victoria - Bangor service was worked by 25031. Photograph collection of webmaster. A fine portrait of 25031, date and location unknown. The commencement of the new timetable in May brought locomotive hauled six coach trains to the Birmingham - Norwich run, with March depot providing the Class 31s. 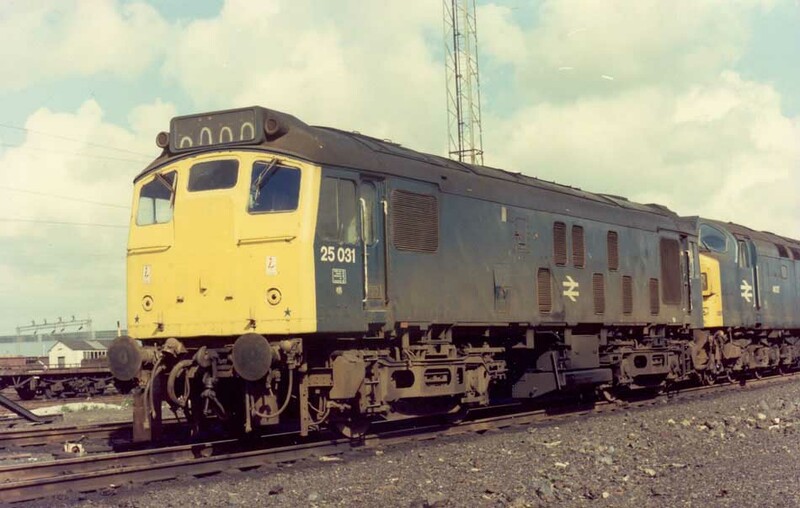 In the event of failures or extras being run motive power was often Class 25s. Such was the case on May 7th when 25031 & 25136 handled a relief 10.05 Birmingham - Lowestoft to Norwich, returning from Norwich with the 14.45 Yarmouth - Walsall. It's June 22nd 1977 and 25031's working days are just about done. Now allocated to Springs Branch 25031 has fallen onto the Tunstead limestone workings, seen here with some southbound empties. By July the locomotive will be at Derby Works, then off to Eastfield and storage. 25031 was noted at Derby Works during July, by October it was transferred to Eastfield and then promptly stored, it never ran again. It was moved to Glasgow Works the same month, being officially withdrawn at the end of December. The withdrawal of 25029/31/96 in 1977 were the first of the ‘standard’ Class 25s to go that had not incurred accident damage, the latter two being Scottish Region locomotives. Page added February 6th 2005. Last updated January 30th 2019.